The styles and the template can be used in any kind of show. My show demonstrates a memorial or heritage show, and that is why I've used my family old pictures, which are in black and white. You may of course use any other kind of pictures. You will be surprised by the effects ! 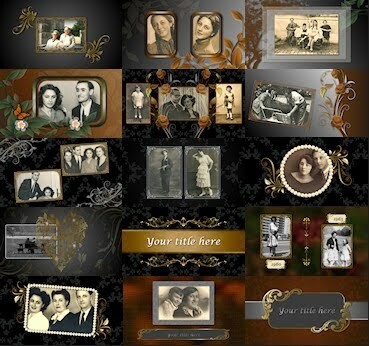 - Template for widescreen shows, which is an exact replica of the demo show. - Separate folder with all the graphic files shown in the demo: Overlays, frames and their masks, and backgrounds (png and jpg files). - Short instructions on how to use the styles and the template . The backgrounds, the frames and all the overlays, can be combined in many ways, allowing you to create many more slides for your show. Most of the decorations can be recolored in Producer for additional and new graphic effects.